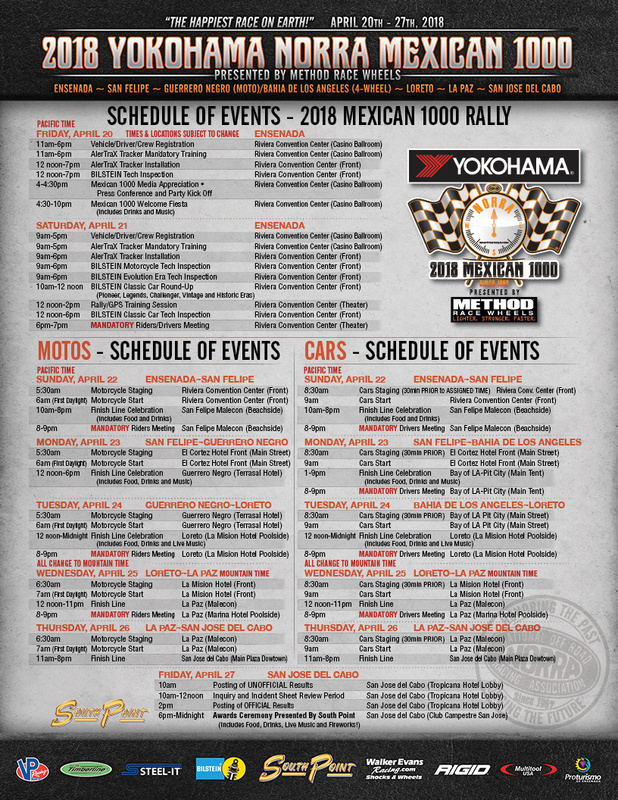 NORRA: NORRA 2018 RA5 - 2018 YOKOHAMA NORRA Mexican 1000 - VP Racing Fuels & MAG-7 Pits Order forms Available Now! Moto entries DO NOT need to register online or order fuel - 91 octane will be provided for you at all of the pits, and gas will be available for purchase at Pemex stations on the transit stages throughout the race. If your moto needs a higher octane VP fuel, please contact the MAG-7 Race Director: geoff@bajabound.com. If MAG-7 will be fueling your car or truck, you must register and pay for your fuel online at mag7race.bajabound.com/#/events. All fuel orders must be received by Tuesday April 10th! If MAG-7 is not fueling your car or truck, you DO NOT need to register for pit service. Simply pull in to any MAG-7 pit during the race for assistance. MAG-7 HQ will be staged in the San Nicolas Hotel parking lot starting the afternoon of Wednesday, April 18th. Come by and say hello! If you would like any spare tires or parts sent to the pits, please mark them with your name, vehicle number, day of the race, and the pit location it will go to. The deadline for drop offs at San Nicolas is 10AM on Saturday, April 21st. IMPORTANT! Fuel orders must be received by Tuesday April 10th so the fuel can be imported into Mexico. Do not wait until the last minute as it creates logistical issues for both VP Fuels and MAG-7! MAG-7 has both "FULL SERVICE" pits set up at roughly the half way point of most specials. With "BIKE'S ONLY - SPLASH" pits being set up at various locations to help two wheel participants to reach their final destinations. It should be known that ALL pits will be equipped with tools, general lubes, power, welder, etc. to assist ANY racer in need. More info on this will be given by MAG-7 at the driver's meeting in Ensenada.